A soggy ManxCat slips in another 200km Audax on this fabulous Sportive event. My goodness. I’ll try not to mention the weather more than just once. Not to be discussed again this year! You guessed it, it rained – and rained – and rained throughout the Isle of Man Lighthouse Challenge Sportive. 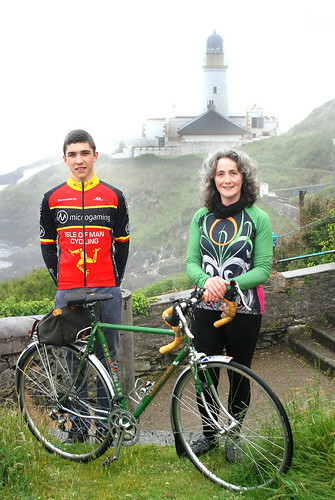 Up and coming young cyclist Jake Kelly with myself, in front of the Douglas Lighthouse for the promotional photograph used in the Manx Independent – Photograph taken by Isle of Man Newspapers and kind permission granted for its use on Cycleseven.org. So…. 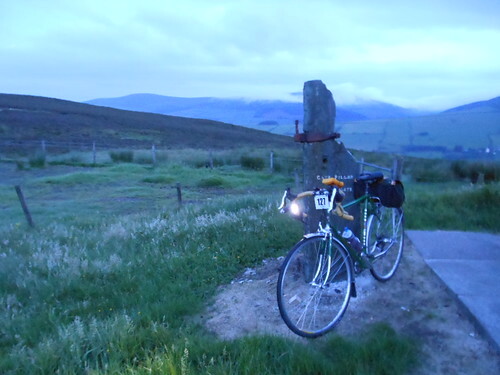 The Isle of Man Lighthouse Challenge Sportive 2012 – my little report on it. 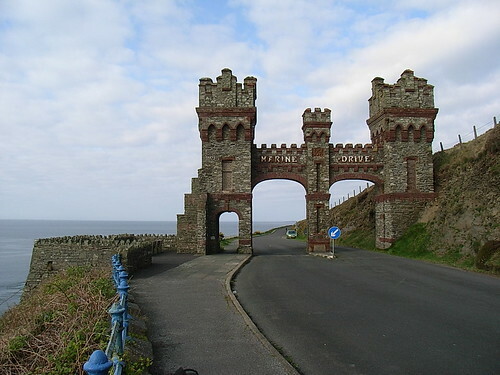 Whereas Hilary’s home island – the Isle of Wight seems to have Sportive events almost every weekend in the summer months, here on the Isle of Man, we have 2 that I know of. The Lighthouse Challenge, and the Appleby Sportive. Which, I find odd, considering our outstanding cyclist pedigree. Rob Holden, one of the ride organisers, who is himself an ex professional cyclist, is hoping to change this, and it is his and the intention of other like-minded cyclists on the island, to get the Lighthouse Challenge ride put onto the Sportive Calendar properly, making it a even more prestigious event than it already is turning out to be. Last year, was the first pilot-run of the Lighthouse Challenge, and some minor adjustments to the route this year have improved the ride, making it a solid 100 mile distance. Not only this, but you can electronically 'dib' in and out of the feed controls, I have ridden in a number of UK based Sportive events now, and the Sportives on the IOM have been the only events I’ve ridden in, where you can do this, so your stop at a feed control, is basically discounted from your time! This can’t happen in Audaxing though, nope, you get time-charged for everything – if your wheels ain’t a turning, then your running out of time. My mistake this year, was being fitter than last year, and having put in many cycling hours up to the end of June, plus a 100km and another hilly 50km on our Tynwald Day and Jubilee Bank Holiday day (5th and 6th July) respectively before the event. My legs were full of spice and energy and raring to go. Which meant, I reached the Sportive starting gate at our Grandstand (used for the TT and GrandPrix motorbike races), an hour before I expected to. Having cycled 36 miles from home to the official start, taking a somewhat long way round. Hetchins fully lit up, on the Mountain road, cycling round via Sulby and Ballaugh to the official Grandstand start in Douglas. My Garmin Etrex 30 was ‘following’ my ride today, so I could verify my distance with Audax UK, and I was worried constantly about the batteries giving out, so an hours wait at the Grandstand wasn’t going to be on the agenda. Besides, I had already arranged with Rob that I would not be dibbing today. So off I went. 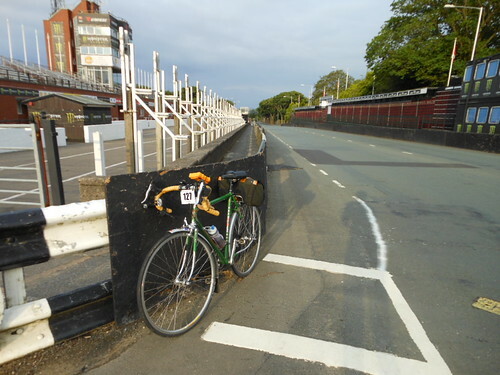 Hetchins looking somewhat lonely and lost at the start of the Sportive on the Isle of Man TT Grandstand. The route for the Sportive is an attractive one. It should suit many different types of cyclists. For the hill cyclist there are... well... Hills. I am sure it is in part due to these hills, that the likes of Peter Buckley, Stuart Slack, Mike O’Hare, Ian Sharpe, the Kennaugh family, Jonny Bellis to name but a few, and my inspiration into cycling proper – Marie Purvis, have helped to sculpt the necessary talent needed to win Commonwealth Games, World Championships, Paralympics and Olympic medals in cycling, as well as those important Stages in the Tour de France by our very own Mark Cavendish. The first biggie hill – well, its not a biggie, more of a hamstring stretch, is up to Marine Drive, then some humpy dumpy ones up the Howe Road a few miles along the ride. From Cregneish, it’s a lovely swoopy, loopy run down to the Sound. Very scenic, good bit of tarmac and one you can enjoy, but in these conditions (water dripping off my nose conditions), keeping fingers engaged in brakes was a top idea! And remember, gravity takes you down, and you need to climb back up! Don’t think the ‘up’ stops there either, ‘cos you need to go up, up and up a tad more, as you grind away to the Roundtable with a top height of 356 meters (I’m an Audaxer, sorry no imperial height from me). Onward to the South of the island. After the lovely restful downhill into Peel, the route levels out for those cyclists who like a bit of speed. My Hetchins was pressed into Big Ring (we don’t use that much here), and off we sped. 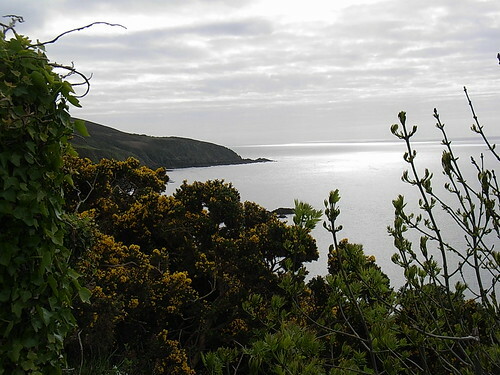 This is a lovely part of the island, even in rotten weather the graceful scenery glows from the hedgerows and the sea air refreshes the legs. During my ride the rain subsided, as is the norm for the Northern part of the island, and it was comforting to be dry again. The roads on the island are mostly quiet, and this pretty route takes the cyclists away from the busy trunk roads whenever possible, leaving you with more time to focus on the event than on the traffic around you, allowing the possibility to ride side by side and chat should you have the energy to do so that is. 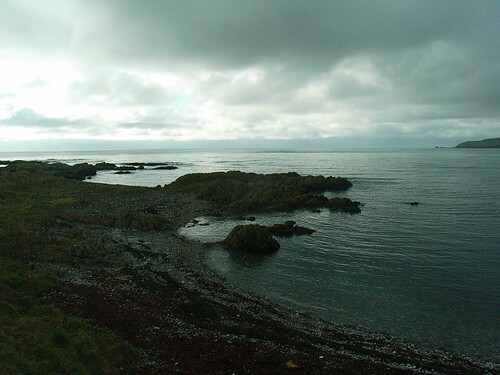 Then, from the flat North, you get a mild surprise in Bride, as the route directs you to the lighthouse at the Point of Ayre, and the humps and bumps left behind by an ancient glacier test your tiring legs, but not as much as the cheeky number will coming out of Maughold that is. Ah, Maughold, sweet Maughold – how I hate cycling you in this direction... Lactic acid in the muscles moan and creak as my little steel-framed lady and I lug ourselves out of the Parish of Maughold and onward towards Lonan, and back into the low cloud that seemed delighted to be depositing yet more of the wonderful wet stuff onto my already water-logged body 🙂 . I’m sure this is why my time was a bit lower than last year, extra weight don’t you know! Leaving Maughold Village, cant face the hill, but what of it! Not that the hills ended there... Cos they didn’t. Differently from last years pilot route, this route took you to the top of the Whitebridge at Onchan, and doubled back at the road junction, taking the cyclist up the hill to Conhrenny plantation and round the back of that to Creg ny Baa and onto the TT course. Oh... tired legs, not wanting to play anymore, were forced and coerced into more activity. But they were well rewarded as we topped the 30mph mark swopping down part of the TT course towards Hillberry, down to Governer’s Bridge and back to the Grandstand. I sort of missed some kind of fanfare at the finish line though for all this effort, but saying that, I got back to the Grandstand by 2.00pm in the afternoon. Well before anyone else. In fact, I didn’t see another Lighthouse Challenge cyclist until I turned my bike towards home where my 200km ride ended officially. Having set off early – in the dark that is, I missed out on all the controls, all the feed-stations, even – the photographer! Rolls eyes upwards, and any kind of welcome home package that might have been there too, had I set off a bit later on. But, I got home in time (yet again) to sort out Sunday dinner for the starvin’, and so a happy, but tired Audaxer, was back at home, with a smiling family round the dinner table (even though I fell asleep during the eating of it!). A big round of applause for everyone who made this Sportive possible, to the route organisers, the controllers, those who provided the tea and cake (how could I have missed that!) to Graham et al who sorted the timing (Manx Timing Solutions), none of whom I saw on my ride on Sunday, but who I know were out there for others. Until next time, next year, when I intend to Sportive with the rest of them. Posted by Mary on July 10th, 2012. What a great report, Mary, and what a great ride! Always full of spirit. Pity about snoozing during supper though. Cycle 130 miles, climb 10,500 feet, and then cook the family dinner. No wonder the newspaper wanted your photo Mary. This is out of my league (even if I could cook or get out of bed at four in the morning). You have covered the whole island twice. Nice photo – the one with Jake Kelly – but so are the others. I'm with Kern, a great report and ride (applauses from me 😀 ). Incidentally you might remember me swallowing a bluebottle – or something – in Yorkshire. Not that I would do this deliberately but maybe they are a kind of magic cycling food! Actually you remind me of Beryl Burton (compliments don't come higher than that!). She used to like to finish her record breaking rides in time to get home to cook Charlie's tea! LOL Shedman and the girls – c o o k i n g.... In MY kitchen! They can all cook and quite well too, but honestly its not worth it, it usually ends up with at least one perfectly lovely saucepan in the bin and more hours to clean up, than a roast chook takes to prepare with veg. Thankfully Sunday dinner isnt a complicated affair, so long as I get home on time. The main reason for an early morning start = an early arrival at home. Luckily for me, I dont sleep for long, and I dont find a 3am start hard (up at that time for breckkie). Ah Chris, the AAA points for a longer ride. Audax altitude award is very useful, as a tag onto the handbook. Reading it, a 200km ride has to have at least 2800m of climbing. But, Im not 100% sure on how many points this brings you. My sportive is as yet to be verified, so Im not sure, but on my last 200km ride which was 3,500m in total, I was awarded 3.5 points. I have as yet to try to fully understand the AAA award system for rides over 200km. 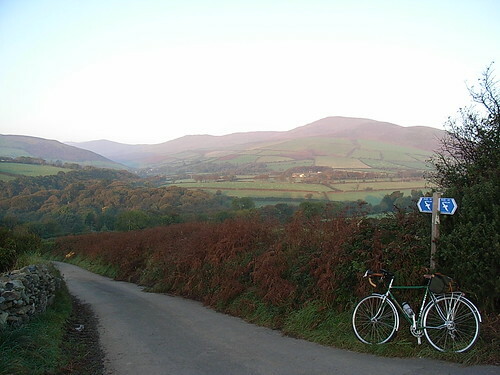 example there is an organised ride from Congleton in July, it is a ride of 2285m of climbing, but is awarded 1.5AAA points. But my 3.500m climber was the full 3.5 value of points. You might be as well to speak to Steve Snook – the AAA Man (email in handbook) and ask him. Distances refer to the distance of an event or event section. If an entire event is not hilly enough to qualify for inclusion in the AAA, then a continuous section of 100km or more within the event may well be hilly enough and can be included. Events shorter than 100km qualify if they are hilly enough, but not sections shorter than 100km.